On Tuesday, October 31st, the University of Florida Graduate School hosted the Gator Graduate Programs Fair. The event was held in the J. Wayne Reitz Union Grand Ballroom, and UF graduate and professional programs were in attendance. Each program/department had representatives that provided information and materials regarding their specific programs, admission requirements, funding opportunities, and research. The Herbert Wertheim College of Engineering’s Department of Industrial and Systems Engineering was in attendance. 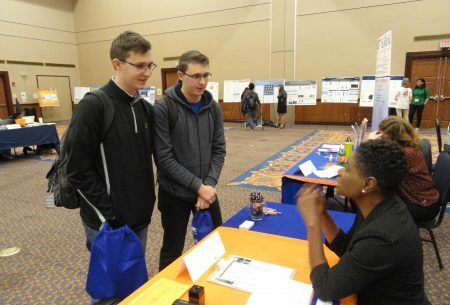 UF ISE Graduate Advisor, Lorraine White, discusses ISE Master’s concentrations with a student. Not only did students from other majors visit the ISE table, but ISE undergraduates, Michael and Scott Stile, did as well. The two noted that they were aware of the ISE Master’s program, but had never been informed in-depth of each option. Also, since they now have full knowledge, and are considering graduate school, they are going to look into the master’s options more thoroughly. 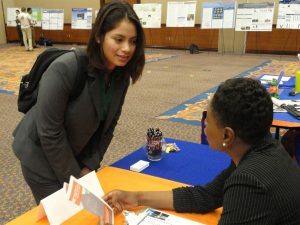 In all, the Gator Graduate Programs Fair was a success, and the Department of ISE can expect some new applicants next year.